b. Tương phản giữa ảo cảm với giác ngộ. che khuất trong đám sương mù dày với các mật độ khác nhau. rõ thêm nỗi khó khăn và không thể đi sâu vào đám sương mù. được sự tiếp xúc nhận biết với linh hồn nhờ việc tham thiền. thành công bản chất đích thực của con người tâm linh. Khố của Thánh Đoàn và có đề cập đến tiến trình đặc biệt này. dần bị xua đi. Trong công việc này không cần phải vội vàng. chính xác ra sao đi nữa. khó khăn tạm thời, chỉ xảy đến khi bạn tìm cách phụng sự. lo lắng, thì sẽ không có hậu quả xấu nào xảy đến. mượn của TUYỆT ĐỐI (ABSOLUTE) (1). 1 Như trên (Mysteries of Magic), trang 70. Pradhana [Hồng Mông Nhất Khí]. 1 Wilson, I, trang 23.
như Vũ Trụ trừu tượng (abstract Nature). 1 Như trên, trang 24. 2 Năm năm của Theosophy, trang 169, ấn bản 1885. (Tanmatras). Xem Sankhya Karika III và Giảng Lý. 40, người ta bảo rằng Thiên Noãn có bảy lớp vỏ bao bọc bên ngoài. biến dịch không ngừng. Thật là một quan niệm nội môn thuần tuý. Tinh Tú Quang (the Astral Light). từ lúc bắt đầu cuộc tiến hoá của Dãy Hành Tinh hiện tại. thích nghi trong Cuộc Tuần Hoàn thứ Năm tới đây. đám sưong mù dày đặc thế thôi chứ không có gì hơn. tạo ra những chất với những thành phần khác nhau. sự sống trên đó, tuy rằng còn tiềm ẩn và vô thức. coi như xác chết, nhưng vẫn là một người sống. nên các Bầu Thế Giới. các chơn linh của năng lượng và tác động” (1). và một hòn đảo lởm chởm những đá. Tinh Quân (the Seven Orders of Dhyanis). nghị trừ phi tồn tại trong Thiên Nhiên. Sống liên tục, cái kia là Sự Sống tạm thời. phẩm của Toàn Linh Trí trên hạ giới. [11/28/2015 8:09:20 PM] Thuan Thi Do: for it is shown in the following sentences in Vishnu Purana: “In the beginning there was neither day nor night, nor sky, nor earth, nor darkness, nor light. . . . . Save only One, unapprehensible by intellect, or that which is Brahma and Pums (Spirit) and Pradhana (primordial matter).” . . . . (Book I., ch. ii.). Now, what is Pradhana, if it is not Mulaprakriti, the root of all, in another aspect? For Pradhana, though said further on to merge into the Deity as everything else does, in order to leave the one absolute during the Pralaya, yet is held as infinite and immortal. The Commentator describes the Deity as: “One Pradhanika Brahma Spirit: that, was,” and interprets the compound term as a substantive, not as a derivative word used attributively, i.e., like something conjoined with Pradhana. * Hence Pradhana even in the Puranas is an aspect of Parabrahmam, not an evolution, and must be the same as the Vedantic Mulaprakriti. “Prakriti in its primary state is Akasa,” says a Vedantin scholar (see “Five Years of Theosophy,” p. 169). It is almost abstract Nature. † In the Sankhya philosophy, the seven Prakritis or “productive productions” are Mahat, Ahamkara, and the five tanmatras. See “Sankhya-karika,” III., and the Commentary thereon. Vol. 1, Page 257 AKASA IS NOT ETHER. These are the reasons why the Occultists refuse to give the name of Astral Light to Akasa, or to call it Ether. “In my Father’s house are many mansions,” may be contrasted with the occult saying, “In our Mother’s house there are seven mansions,” or planes, the lowest of which is above and around us — the Astral Light. * No use to say so to the Hindus, who know their Puranas by heart, but very useful to remind our Orientalists and those Westerns who regard Wilson’s translations as authoritative, that in his English translation of the Vishnu Purana he is guilty of the most ludicrous contradictions and errors. So on this identical subject of the seven Prakritis or the seven zones of Brahma’s egg, the two accounts differ totally. In Vol. 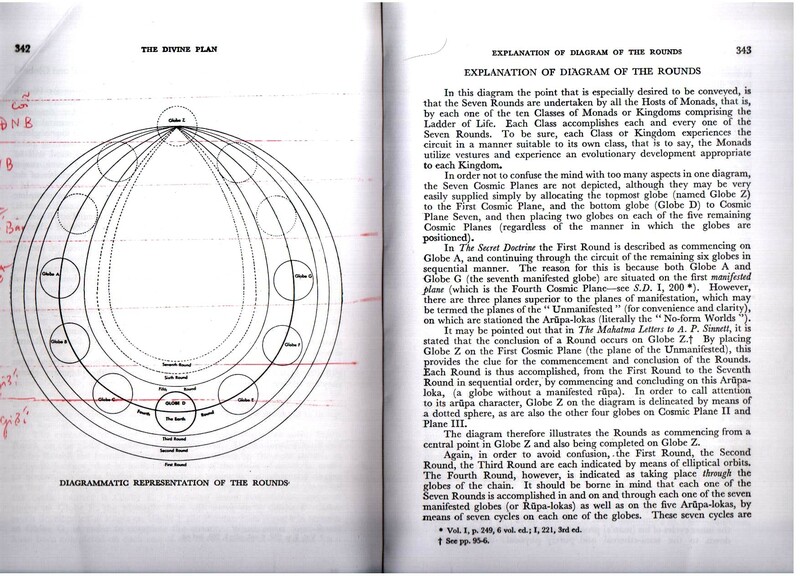 1, page 40, the egg is said to be externally invested by seven envelopes — Wilson comments: “by Water, Air, Fire, Ether, and Ahamkara” (which last word does not exist in the Sanskrit texts); and in vol. v., p. 198, of the same Vishnu Purana it is written, “in this manner were the seven forms of nature (Prakriti) reckoned from Mahat to Earth” (?). Between Mahat or Maha-Buddhi and “Water, etc.,” the difference is very considerable. [11/28/2015 8:10:03 PM] Thuan Thi Do: will, by becoming a familiar fact of Nature to all men, as air is familiar to us now, cease to be as at present hypothetical, and also an “agent” for so many things. And only during that Round will those higher senses, the growth and development of which Akasa subserves, be susceptible of a complete expansion. As already indicated, a partial familiarity with the characteristic of matter — permeability — which should be developed concurrently with the sixth sense, may be expected to develop at the proper period in this Round. But with the next element added to our resources in the next Round, permeability will become so manifest a characteristic of matter, that the densest forms of this will seem to man’s perceptions as obstructive to him as a thick fog, and no more. Vol. 1, Page 259 ATOMS ARE INVISIBLE LIVES. even in laya just as a man in a profound cataleptic state — to all appearance a corpse — is still a living being. When the “Devourers” (in whom the men of science are invited to see, with some show of reason, atoms of the Fire-Mist, if they will, as the Occultist will offer no objection to this); when the “Devourers,” we say, have differentiated “the fire-atoms” by a peculiar process of segmentation, the latter become life-germs, which aggregate according to the laws of cohesion and affinity. Then the life-germs produce lives of another kind, which work on the structure of our globes. Thus, in the first Round, the globe, having been built by the primitive fire-lives, i.e., formed into a sphere — had no solidity, nor qualifications, save a cold brightness, nor form nor colour; it is only towards the end of the First Round that it developed one Element which from its inorganic, so to say, or simple Essence became now in our Round the fire we know throughout the system. The Earth was in her first rupa, the essence of which is the Akasic principle named “that which is now known as, and very erroneously termed, Astral Light, which Eliphas Levi calls “the imagination of Nature,” probably to avoid giving it its correct name, as others do. The Third Round developed the third Principle — Water; while the Fourth transformed the gaseous fluids and plastic form of our globe into the hard, crusted, grossly material sphere we are living on. “Bhumi” has reached her fourth principle. To this it may be objected that the law of analogy, so much insisted upon, is broken. Not at all. Earth will reach her true ultimate form — (inversely in this to man) — her body shell — only toward the end of the manvantara after the Seventh Round. Eugenius Philalethes was right when he assured his readers on his word of honour that no one had yet seen the Earth (i.e., Matter in its essential form). Our globe is, so far, in its Kamarupic state — the astral body of desires of Ahamkara, dark Egotism, the progeny of Mahat, on the lower plane. . . . It is not molecularly constituted matter — least of all the human body (sthulasarira) — that is the grossest of all our “principles,” but verily the middle principle, the real animal centre; whereas our body is but its shell, the irresponsible factor and medium through which the beast in us acts all its life. Every intellectual theosophist will understand my real meaning. Thus the idea that the human tabernacle is built by countless lives, just in the same way as the rocky crust of our Earth was, has nothing repulsive in it for the true mystic. Nor can Science oppose the occult teaching, for it is not because the microscope will ever fail to detect the ultimate living atom or life, that it can reject the doctrine. Vol. 1, Page 261 THE OCCULT CHEMISTRY.